In Arabidopsis thaliana, the gene Tousled encodes a protein kinase of unknown function, but mutations in the gene lead to flowering and leaf morphology defects. We have recently cloned a mammalian Tousled-L ike K inase (TLK1B) and found that it phosphorylates specifically histone H3, in vitro and in vivo. We now report the effects that overexpression of a kinase-dead mutant of TLK1B mediates in a normal diploid cell line. Expression of a kinase-dead mutant resulted in reduction of phosphorylated histone H3, which could have consequences in mitotic segregation of chromosomes. When analyzed by FACS and microscopy, these cells displayed high chromosome number instability and aneuploidy. This phenomenon was accompanied by less condensed chromosomes at mitosis; failure of a number of chromosomes to align properly on the metaphase plate; failure of some chromosomes to attach to microtubules; and the occasional presentation of two bipolar spindles. We also used a different method (siRNA) to reduce the level of endogenous TLK1, but in this case, the main result was a strong block of cell cycle progression suggesting that TLK1 may also play a role in progression from G1. This block in S phase progression could also offer a different explanation of some of the later mitotic defects. TLK1 has a function important for proper chromosome segregation and maintenance of diploid cells at mitosis in mammalian cells that could be mediated by reduced phosphorylation of histone H3 and condensation of chromosomes, although other explanations to the phenotype are possible. Successful cell division depends on the fidelity of events in mitosis. Faithful transmission of chromosomes to daughter cells requires the conversion of extended fibers of chromatin found at interphase into the highly ordered and condensed structures observed at mitosis. Condensation precedes the alignment of chromosomes on the metaphase plate, and it is presumed essential for segregation of sister chromatids into daughter cells. Condensation requires the condensing machinery , SMC (structural maintenance of chromosomes) proteins, and modification of histone tails . Recent evidence suggests a link between phosphorylation of histone H3 and chromatin condensation [3, 2]. The Tousled gene of Arabidopsis thaliana encodes a protein kinase which, when mutated, results in abnormal flower development characterized by a stochastic loss of floral meristem and organs [4, 5]. Two mammalian Tousled-like kinases were cloned by Nigg's group  who also reported that the activity of these kinases is maximal in S phase, and more recently they were reported to be targets to checkpoint kinases, ATM and Chk1 . We have recently cloned a cDNA encoding a mammalian Tousled L ike K inase (TLK1B) from a subtraction library of cells transformed by the translation initiation factor eIF4E . We subsequently discovered that TLK1B specifically phosphorylated Ser10 of histone H3 in vitro when assayed in a mix of core histones or isolated chromatin, and that TLK1B and H3 formed a tight complex. Moreover, expression of TLK1B in a yeast strain harboring a temperature-sensitive mutant of the major H3 kinase, Ipl1, complemented the growth defect and restored normal levels of histone H3 phosphorylation . This evidence indicated that histone H3 is a preferred substrate for TLK1B. Although a few Aurora/Ipl1p-related kinases have been identified in mammalian cells [9, 10], neither their function at mitosis, nor their role in H3 phosphorylation is well known. A correlation between phosphorylated histone H3 and chromatin condensation was suggested by co-localization of members of the condensin complex with phosphorylated histone H3 in the pericentromeric regions during the early stages of mitosis . Recently, phosphorylation of histone H3 at Ser10 by the Drosophila Aurora B kinase was shown to precede the recruitment of the Condensin complex and organization of the spindle assembly . Phosphorylation of H3 seems essential for chromosome segregation in Tetrahymena, since gene replacement of histone H3 with an Ala10 mutant resulted in loss of DNA from mitotic micronuclei , although the same replacement in S. cerevisiae had no apparent phenotype . While a similar correlation between phosphorylation of H3 and appearance of condensed chromosomes has been found in mammalian cells, the presence of multiple genes encoding H3 makes it impossible to conduct comparable gene replacement studies. Furthermore, although homologues of Aurora have been found in mammalian cells, it has not been established whether they are required, or involved, in phosphorylation of histone H3 at mitosis. Other kinases have been implicated in the phosphorylation of histone H3 after serum stimulation of mammalian cells [13, 14], a phenomenon distinct from what occurs at mitosis. In other organisms, the essential kinase Ipl1 (increased ploidy) has been shown to be involved in mitotic phosphorylation of H3 in yeast , while in Aspergillus the kinase NIMA was implicated . The mammalian Tousled (TLK1) is not related to the Aurora/Ipl1 family or to NIMA, therefore, candidates involved in mitotic phosphorylation of histone H3 have not been positively identified in mammals. Our experiments with overexpression of a kinase-dead mutant of TLK1B (referred to as TLK1B-KD) now indicate a function important for proper chromosome segregation, and suggest that phosphorylation of H3 is important for chromosome dynamics at mitosis in mammalian cells. However, other explanations and other TLK1 substrates could be responsible for the mitotic defects. Different approaches to eliminate specific gene expression or function are currently used. The optimal model is targeted disruption of genes, but this is labor intensive and time-consuming for mammalian cells, or impossible if the targeted gene is essential. Thus, we started with overexpression of a dominant negative protein as a means to override the endogenous TLK1 and suppress its specific functions. To generate a dominant negative mutant of TLK1B, we replaced the highly conserved D386 and K389 residues in the ATP-binding pocket with Ala. In vitro the mutant kinase, expressed as a GST-fusion in bacteria, lost the capacity to phosphorylate itself and histone H3 (see figure 7). The kinase-dead (KD) protein was then expressed from the BK-Shuttle vector as we have done before for the wt TLK1B . This vector replicates as an episome with a very consistent copy number in each cell and hence, the transfected population gives homogeneous expression of the transgene, making it unnecessary to select individual G418-resistant clones. This is an important point since the results obtained thereafter cannot be simply attributed to the selection of an aberrant clone. The expression of the KD protein in a normal mouse breast epithelial line, MM3MG, is shown in Fig. 1A in comparison to the wt protein. Cells were labeled with [35S]methionine, extracts were prepared and subjected to immunoprecipitation (IP). The main endogenous product migrates as an 85 kDa protein (labeled TLK1). The protein expressed from the vector is a splice variant (TLK1B) lacking the first 238 amino acids, so that it can be clearly distinguished from the endogenous product, whereas it has been difficult to assess overexpression of the full-length mutant kinase over the endogenous product. We have previously shown that the two proteins have similar localization and substrates [ and data not shown]. The ratio of TLK1 to TLK1B can be used to normalize the results, and showed that the expression of the KD mutant and wt was equivalent in the stable transfectants. In general, any dominant-negative effect from the KD protein would be expected to interfere with the function of all isoforms of TLK1, of which several splice variants have been described . Overexpression of TLK1B-KD reduces the level of phosphorylated histone H3. a. 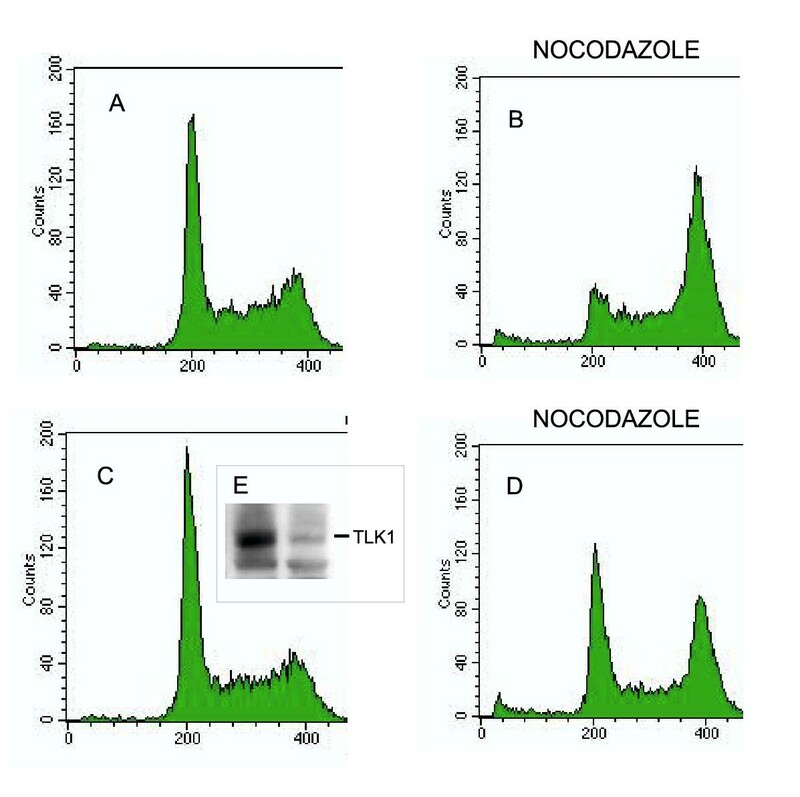 Expression of wt and KD mutant TLK1B assessed by labeling the proteins with [35S]methionine and immunoprecipitation . b. Western blot of histone H3 and phosphorylated H3 in the indicated cell lines, as explained in Methods. The bar-graph is the plot of three different experiments analyzed by densitometry, and shown as the average for each cell line and standard deviation. We have previously shown that overexpression of wt TLK1B did not alter the cell cycle distribution, although it increased the phosphorylation of histone H3 in asynchronous cells . This result was repeated in Fig. 1B, using an antibody specific for histone H3 phosphorylated at Ser10. Overexpression of wt TLK1B increased the phosphorylation of H3 2.3-fold in comparison to untransfected MM3MG (Fig. 1B, lower panel). In contrast, overexpression of the KD mutant resulted in 60+/-10% decreased phosphorylation of H3. 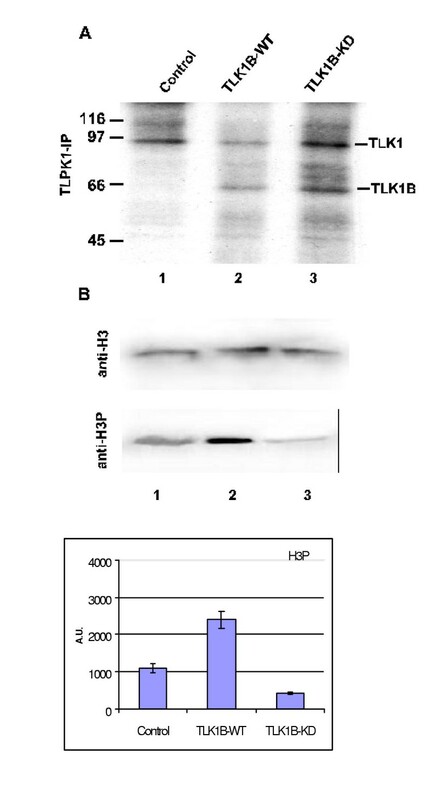 Note that the total amount of histone H3 was equivalent in all samples, as determined in a parallel blot probed with an antiserum to a non-phosphorylated epitope of H3 (Fig. 1B, upper panel). Despite the reduction in H3 phosphorylation in the MM3MG-KD cells, there was only a modest increase in generation time (33 hr vs. 30 hr for control cells transfected with the empty vector). About 10% of the cells stained with trypan blue (i.e., dead), in contrast to less than 1% of control. These results initially suggested that reducing the phosphorylation of H3 by 50% did not cause major disruptions in viability or cell division. However, analysis of the cell cycle distribution by flow cytometry revealed a different story. Fig. 2 shows the normal diploid (DP) distribution of MM3MG and MM3MG-TLK1B cells in G1 and G2/M phases, with 2 n and 4 n DNA content. In contrast, the MM3MG-KD cells showed a dramatic increase in appearance of aneuploid cells with greater than diploid complement (Fig. 2), which we have indicated as G1-AP and G2/M-AP (for aneuploid). The three MM3MG lines were arrested at G2/M with irradiation (IR), to better delineate the presence of two distinct populations in MM3MG-KD-diploid and aneuploid. Overexpression of TK1B-KD affects the ploidy of MM3MG cells. The cell cycle distribution of the indicated lines was analyzed by PI staining and FACS. The right panels show cells 24 h after treatment with 10 Gy of radiation. To begin assessing the defect leading to aneuploidy, we examined mitotic cells by fluorescence microscopy after staining the microtubules with a α/β-tubulin monoclonal antibody and the chromosomes with DAPI. A large proportion of the cells observed showed mitotic abnormalities. Typical mitotic defects included: a failure of a number of chromosomes to align properly on the metaphase plate (Fig. 3, panel B); a failure of a number of chromosomes to attach to microtubules (panel B, arrow); the occasional presence of two bipolar spindles (panel B) with the centromeres of individual chromosomes randomly attached to either of the spindle poles (panels B and C); and the persistence of microtubule bridges between two daughter cells after telophase and cytokinesis has occurred (panels D and E). These defects were never observed in control cells. In extreme cases, most chromosomes migrated to one spindle pole, and only a small fraction to the other (panel C). A large number of mitotic chromosome preparations from the MM3MG-KD cells were aneuploid with a median chromosome number of 64 (panel F), instead of 40 (2 n) observed for the parental MM3MG cells. The aneuploid number of chromosomes was highly variable (mean 60+/-8, mode 64), suggesting a high level of genomic instability induced by TLK1B-KD. Overexpression of TLK1B-KD results in missegregation of chromosomes and other mitotic abnormalities. a. A normal metaphase in MM3MG-KD cells. b. Multi-polar spindles frequently found in MM3MG-TLK1B-KD cells. c. Unequal segregation of chromosomes in MM3MG-TLK1B-KD cells. d. Persistence of microtubules from the mitotic spindle after metaphase. e. Persistence of microtubules after cytokinesis found frequently in MM3MG-TLK1B-KD cells. f. A representative metaphase chromosome spread with 84 chromosomes from an MM3MG-TLK1B-KD cell. 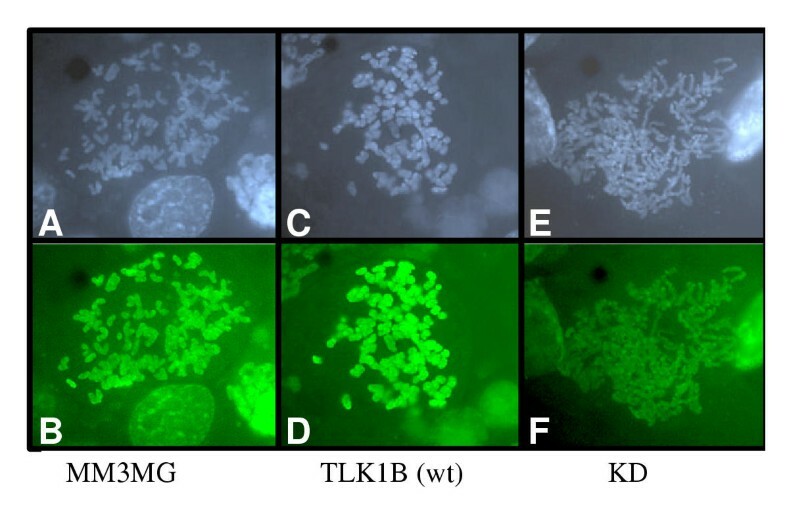 Immunofluorescence analysis on metaphase chromosomes of TLK1B-KD cells with the phospho-specific antiserum showed reduced phosphorylation of histone H3 in comparison to control MM3MG or TLK1B-overexpressing cells (Fig. 4, P = 0.00115, see Methods), and the chromosomes appeared less condensed (Fig. 4F). Overexpression of TLK1B-KD results in reduced histone H3 phosphorylation and poor condensation of metaphase chromosomes. Metaphase spreads from each cell line were prepared, and chromosomes were decorated with anti-histone H3P and FITC-conjugated secondary antiserum. Panels A, C, E are DAPI-stained chromosomes; panels B, D, F are stained with anti-histone H3P. Panels A and B are chromosomes of MM3MG controls; panels C and D are cells overexpressing wt TLK1B; panels E and F are cells expressing the KD mutant. The signal from phosphorylated H3 was analyzed from 10 metaphases and five random fields of each. The values were as follows: MM3MG, median pixel intensity 168 (+/-10.6 SEM); TLK1B-overexpressing cells, median 183 (+/-6.9 SEM); TLK1B-KD cells, median 133 (+/- 7.4 SEM). It has been shown that phosphorylation of histone H3 begins within pericentromeric heterochromatin during G2, coincident with chromosome condensation . Loss of phosphorylation of H3 in this region of the chromosome is believed to result in a loss of kinetochore assembly and microtubule attachment [18, 11]. Specifically, ablation of the Drosophila Aurora B kinase with siRNA resulted in reduced phosphorylation of H3, loss of chromosome condensation, and in polyploidy . Our results are consistent with this model of chromosome remodeling and dynamics, but we were able to do it in a stable cell line. As an alternative method to a dominant negative mutant, we reduced the expression of TLK1 by transfection of cells with siRNA. The level of TLK1 protein was reduced at least 10-fold by the siRNA (Fig. 5E). However, instead of aneuploidy, the effect of this reduction of TLK1 was primarily a very slow progression from G1. This can best be observed by treatment of cells with nocodazole for 18 hr, which in control cells produced the expected nearly complete accumulation of cells in G2/M (panel B). 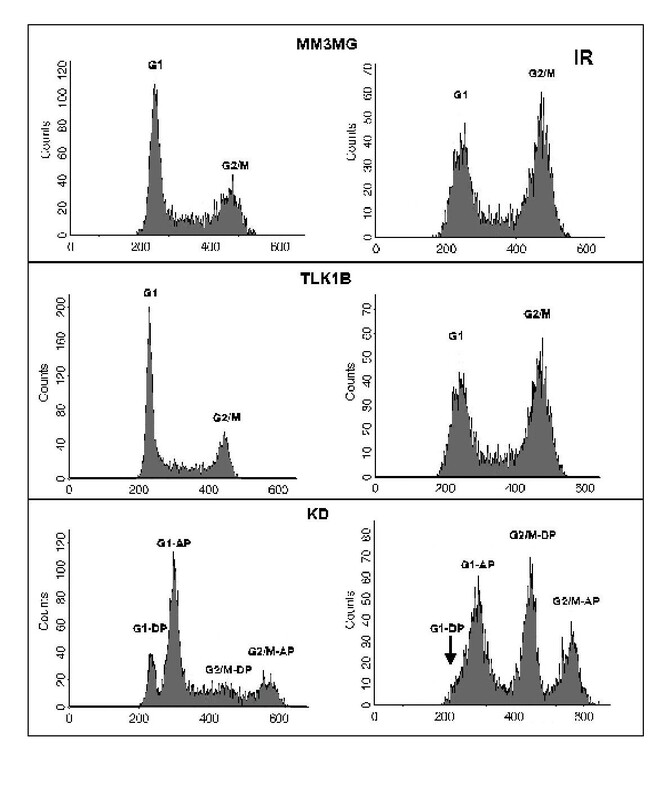 In contrast, a large proportion of cells treated with the TLK1 siRNA remained in G1 (panel D). It should be noted that the effect of the siRNA in these experiments could only be followed for one or two cell divisions, in contrast to the TLK1B-KD mutant, which is a stable line. 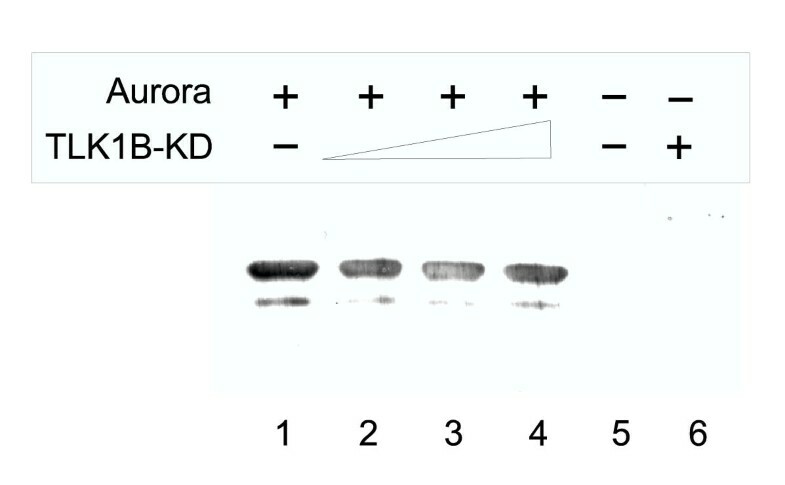 Furthermore, the expression of TLK1B-KD was approximately equivalent to the endogenous TLK1, whereas the reduction of TLK1 with siRNA was nearly complete. This suggests that TLK1 has also a function in progression into S phase. Indeed, Sillje reported that the activity of TLK1 is maximal in S phase and drug-induced inhibition of DNA replication causes a rapid loss in TLK1 activity . It was also reported that TLK1 is subject to phosphorylation by the S phase DNA damage checkpoint kinases . It is possible that spontaneous DNA damage during S phase, in the absence of TLK1 activity, could contribute to genomic instability at mitosis. Transfection of siRNA against TLK1 mRNA results in slow progression from G1. Cells were transfected with duplex siRNA oligos, control (scrambled sequence: panel A and B) or TLK1 (panel C and D). Forty-eight hours after transfection, cells were treated (panel B and D), or not, with 1 μM nocodazole for 18 h. The inserted panel E is a western blot of TLK1 with and without treatment with siRNA. A recent report demonstrated a functional interaction between TLK1 and the human chromatin assembly factor Asf1 . Furthermore, Asf1 was found to interact with histone H3  and Rad53 , linking the control of chromatin assembly to DNA damage. Interestingly, we previously demonstrated that overexpression of TLK1B conferred radioresistance in MM3MG mammalian cells . To assess if expression of the mutant kinase would result in increased sensitivity to IR, clonogenic survival assays were performed. The cells were exposed to 0,1,2 and 4 Gy irradiation. Notably, disruption of TLK1 function in mutant cells was associated with decreased clonogenic survival. 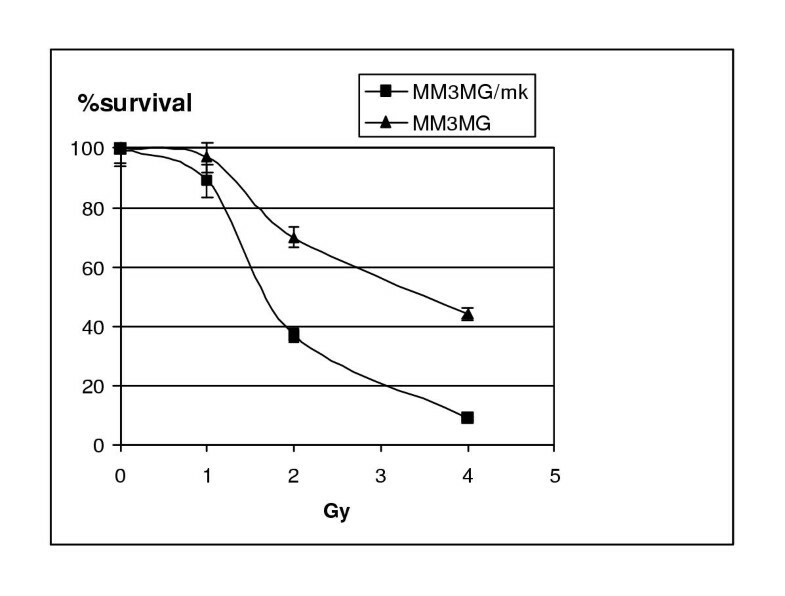 MM3MG-KD cells demonstrated 4.5-fold reduced survivability at 4 Gy compared to the parental MM3MG cells (Fig 6). The extreme sensitivity of the TLK1B-KD cells to IR, suggests that chromosome breakage due to radiation exacerbates the problems of missegregation and kinesis already evident in these cells. Radiation sensitivity in TLK1-KD cells. Cells were exposed to 1, 2, and 4 Gy of gamma radiation and cell survival was measured with a clonogenic assay. The standard errors of mean were calculated at each dose. TLK1B-KD does not inhibit Aurora B. The reactions in all lanes contained 100 ng of histone H3 (Boehringer Mannheim) and kinase buffer . Lanes 1–4 have 100 ng of Aurora B kinase; Lanes 2–4 have increasing concentration of TLK1-MK, 0.1 μg, 0.3 μg and 1.0 μg respectively. Lanes 5 and 6 are negative controls, lane 5 having only histone H3 while lane 6 has histone H3 and 100 ng of TLK1B-MK (Kinase-dead mutant). The blot was reacted with phospho-histone H3 antiserum. While the reduction in histone H3 phosphorylation was obvious, we could not conclude that this is the only cause for the observed mitotic defects by TLK1B-KD cells, as opposed to some other aspect of chromosome segregation. For example, perturbation of Aurora B function also impaired the ability of INCENP to concentrate at centromeres and its transfer to the spindle midbody at telophase, as well as regulating the assembly of the cleavage furrow [22, 23]. It is also not certain that the dominant negative effects are through direct inhibition of wt TLK1. Indirect inhibition of Aurora B phosphorylation of histone H3 through substrate competition could also explain the mitotic defects. However, we tested the in vitro phosphorylation of H3 by human Aurora B in the presence of increasing amounts of TLK1B-KD protein, and there was no inhibition of phosphorylation (Fig. 7). Thus, inhibition of Aurora B activity does not seem to be a very likely explanation for the phenotype reported here. Errors in chromosome segregation and cytokinesis result in cell death or oncogenesis. It is possible that altered mitotic phosphorylation of histone H3 or similar defects in chromosome condensation and segregation have relevance to the genomic instability and aneuploidy typically found in cancer cells. Mutants of Tousled in A. Thaliana display pleotropic defects of the floral meristem and gynoecium, but neither the mechanism underlying these defects nor the substrates of this kinase have been elucidated. Since TLK1B phosphorylates histone H3 at Ser10 with high specificity , we hypothesize that this may play an important role in chromatin remodeling during DNA replication, repair, and at mitosis. An impairment of these functions would be expected to result in aberrant divisions and cell death, as found in Tousled mutants . Using a dominant negative mutant of TLK1 and siRNA, we have presented evidence suggesting that TLK1 plays an important role in chromosome dynamics, first at entry into S phase, as previously reported in , and then at mitosis during condensation and segregation of chromosomes. We favor a mechanism by which loss of phosphorylation of histone H3 results in impaired recruitment of the condensing complex and resulting in impaired chromosome dynamics at mitosis. However, it is also possible that loss of TLK1 function early in S (as indicated by the siRNA experiments) could result in chromosome damage during replication by inhibiting the remodeling of chromatin by Asf1. However, this seems less likely as we have not seen evidence of chromosome breakage and rearrangements in the cells expressing the KD mutant – only aneuploidy. Regardless of mechanism, TLK1 appears to have a clear effect on chromosome stability and maintenance of the genome. Construction of the vectors to overexpress TLK1B was described previously . To generate the KD mutant in the vector pGX4T, site-directed mutagenesis was carried out using the Quickchange kit (Stratagene) and the primers: 5'-gtggtgaaatcgcaatcactgcttttggtctgtcc-3' and 5'-gacagaccaaaagcagtgattgcaatttcaccacatg-3'. The two-codons mutation was confirmed by sequencing using the primer 5'-caaaccccctattatacatt-3'. The TLK1B-KD open reading frame was then cloned in the BK-Shuttle episomal vector . MM3MG cells (normal mouse mammary epithelial cells) were purchased from the ATCC, and cultures and G418-selection were as described previously . The anti-TLK1B rabbit antiserum was prepared in our lab . The anti-histone H3 and phospho-specific H3 sera were from Upstate Biotechnology, Lake Placid, NY. Secondary HRP-conjugated anti-rabbit serum was from Sigma. For western blots, 30 μg of protein of each sample was separated on a 15% SDS-PAGE gel. The proteins were transferred to Immobilon-P membrane (Millipore), and incubated for 1 h each with primary and secondary antisera (1:1000 dilution). Finally, the membranes were washed and developed by chemiluminescence (ECL, Amersham, Piscataway, NJ). Cells were harvested from sub-confluent flasks and resuspended in Dulbecco's Modified Eagle medium at a density of 104 cells per ml. The cells were gamma irradiated at different doses (1, 2 and 4 Gy) and 200 cells were plated in triplicates in 6-well plates. Control cells did not receive any irradiation. After 10 days, the plates were stained and colonies counted. Double stranded RNAs were synthesized by Xeragon, Qiagen (Valencia, CA). The sequence targeted in TLK1 (accession no. XM_130372) was AAACACGCTTGCCGAGAGTAT, which corresponded to coding region 1362 – 1382 from the first nucleotide of the start codon. Mouse MM3MG cells were plated in 6-well plates, 24 h prior to transfection, to obtain confluency of 40% on the day on transfection. Cells were transfected with control (scrambled) siRNA, or TLK1 siRNA at a final concentration of 250 nM using Oligofectamine reagent (Invitrogen, Carlsbard, CA). The transfections were performed following the manufacturer's protocol. After 48 h cells were treated, or not, with 1 μM nocodazole for 18 h. Cells were harvested after 64 h and processed for cell cycle analysis by propidium iodide staining. This was carried out at the LSUHSC core facility. For cell cycle analysis with propidium iodide-stained cells, a FACSCalibur flow cytometer was used. Sub-confluent flasks of control MM3MG cells and MM3MG-TLK1B-KD cells were arrested in mitosis by incubation with 250 ng/ml Colcemid (Gibco) for 5 hrs, prior to selectively harvesting mitotic cells by shake-off. 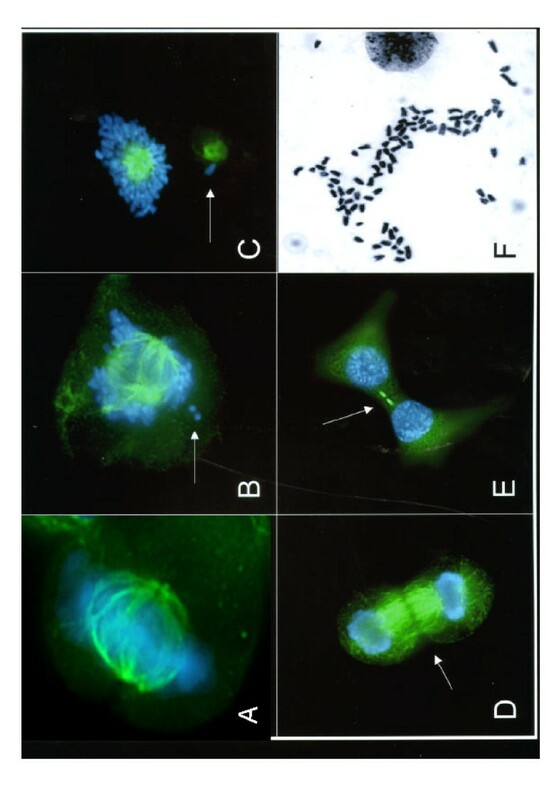 Cells were swollen in 0.1 M KCl with 0.1 mM phenylmethylsulfonyl fluoride (PMSF) for 10 minutes at 37°C and then cytospun onto glass slides using a Cytospin 3 (Shandon Instruments, Inc., Pittsburgh, PA) at 2000 rpm for 2 minutes. The slides were either stained with crystal violet or processed for immunofluorescence as described below. Ten random intact metaphase spreads were counted and used for statistical analysis. The mean, median, mode and standard deviation were calculated. Using a student's t statistic, the mean number of metaphase chromosomes in the TLK1B-KD mutant cells was significantly higher than the diploid number of chromosomes found in the MM3MG parental cells, p < 0.0001. MM3MG cells and MM3MG-TLK1B-KD cells were grown on 2 well chamber slides (Nunc) to 50–70% confluency in DMEM. Cells were rinsed in PBS and then fixed in 1.0% formaldehyde in PBS for 1 h at room temperature. Cells were permeabilized in 0.1% saponin/20 mM glycine/PBS for 20 minutes, and incubated with a 1:100 dilution of an anti-α/β tubulin monoclonal antibody (NeoMarkers, Freemont, CA) for 1 h. After washing in PBS, cells were incubated with a 1:1000 dilution of an anti-mouse IgG-fluorescein (FITC) secondary antibody (Vector Laboratories, Burlingame, VT) for 1 h. Nuclei were counterstained with DAPI (4'-6-diamidino-2-phenylindole). Phospho-histone H3 immunofluorescence on metaphase chromosomes was done as described previously . Following cytocentrifugation, the cells were rinsed with cold PBS, and soluble proteins were extracted with 0.5% Triton X-100 in PEM (80 mM K-Pipes, pH 6.8, 5 mM EGTA, pH 7.0, 2 mM MgCl2) for 2 minutes at 4°C. Then, cells were fixed in 4% formaldehyde (Fisher Scientific, Pittsburg, PA) in PEM for 20 minutes at 4°C and blocked overnight at 4°C with 5% milk in TBST (20 M Tris-HCl, pH 7.6, 137 mM NaCl, 0.1% Tween 20). Rabbit anti-phospho-Ser10 histone H3 antibody (Upstate Biotechnology, Lake Placid, NY) was diluted to 0.2 μg/ml in TBST and incubated at room temperature for 2 h. Slides were washed twice in TBST prior to incubation in anti-rabbit IgG secondary antibody conjugated to FITC (Vector Laboratories Inc., Burlingame, CA), diluted to 1:1000 in TBST, for 1 h at room temperature. DNA was counterstained with DAPI in anti-fade mounting medium (Vector Laboratories Inc., Burlingame, CA). Specialized image analysis software (Vysis, Inc., Downers Grove, IL) was used to determine pixel intensity of the histone H3 fluorescence. Green fluorescence (FITC) was detected using a single pass FITC-filter and DAPI (blue fluorescence) with a UV-specific filter. Monochrome images were captured using an Olympus BX-60 epifluorescence microscope equipped with a Photometrics cooled-CCD camera (Photometrics, Tucson, AZ) and Images were pseudocolored and merged to produce the final images of the nuclei and microtubules. All images were taken at 1000× total magnification. This work was supported by grant CA69148 from the National Institutes of Health and grant BCTR0100512 from the Susan G. Komen Foundation, to ADB. We wish to thank Ciaran Morrison, Science Foundation Ireland for the gift of recombinant human Aurora B.
YL prepared the kinase-dead mutant of TLK1 and obtained the stably-transformed cell line. She then performed the immunoprecipitation in Fig. 1. GSD performed all the other experiments in the paper. BW provided assistance with microscopic analysis of the experiments and statistical analysis of the acquired images, as well as preparation of chromosome spreads.